In today’s extremely competitive and rapidly changing business environment, decisions about adopting the latest technology and acquiring tools that will enable easy transition to future enhancements are critical to the survival of any business. Determining whether to invest in recent advancements in telecommunications is no different. One particular technology receiving significant attention is VoIP (Voice over Internet Protocol). VoIP is one of the hottest buzz words surrounding communications technology, because it can revolutionize the way we communicate. As with the adoption of any technology, companies must take appropriate steps in order to successfully implement VoIP and reap its benefits. Simply put, VoIP is the process of converting voice signals into data packets, using Internet Protocol (IP) to transmit voice over a data network. There are a few distinct benefits that companies receive when utilizing IP telephony. How to Save Money with VOIP! The most widely publicized benefit of VoIP is the ability to save costs on long distance charges and to network multiple offices together. In a traditional setting, someone would have to dial the phone number to a branch office, possibly paying a long distance charge for the call, wait for a receptionist or automated system to answer and then become connected to the party they’re trying to reach. 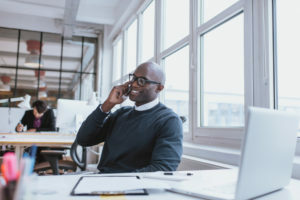 Using VoIP, a person can simply dial an extension number and be connected immediately to a party in another office, whether across town or around the world avoiding costly long distance charges. A second benefit is in the design of many telephone systems. Rather than traditional phone systems with their own wiring infrastructure, IP based systems use a data network infrastructure. This convergence of voice and data into a single platform has tremendous advantages in simplifying the administration of the communications network. Plus, VOIP utilizes data infrastructure that most likely already exists in many companies. A third benefit is the ability to have remote phones with a single telephone number. For example, an employee could work out of their home in New York, utilizing a phone number with a California area code. This enables corporations to truly take advantage of having a virtual office and or remote agents working out of a variety of locations. VoIP is gaining acceptance into the corporate world, especially in small to medium sized companies looking to save costs and wanting an edge over their competitors. A report by Infonetics Research found that while nearly all businesses are currently evaluating or planning to expand their VoIP traffic, still just 36% of large companies and 23% of midsize companies have made the transition. Companies are now in the process of determining how this technology will help their business and to what extent they need to deploy VoIP. They are asking themselves “How can I take advantage of IP telephony and when is it right for my business?” In order to help businesses make the right decisions, a few important steps should be taken. · First, ask the important question, “What am I trying to accomplish?” Make a point to tie your business objectives to the benefits of VoIP. Will this technology help you achieve your goals? · Adopt the following technology mission statement: “Technology should help my business become more profitable and gain a competitive edge.” Determine whether or not VoIP will do this for your company. If it does, it will probably justify your investment. · Thoroughly analyze each VoIP manufacturers’ products and obtain an understanding of their benefits. Find a manufacturer that is willing to help you become more profitable and more competitive. Identifying the right solution can make a world of difference during installation and use. Determine whether to implement a system that will give you full VoIP capability today or have the ability to make the upgrade in the future. Your company may not be ready to take advantage of IP telephony in the present time, however, it may make sense toinstall a system that will give you VoIP at the flick of a switch when you’re ready (Such as the Mitel 5000 or 3300, from McEnroe). · Finally, select a telecommunications partner who is just as thorough in evaluating your needs as you are. Identifying the right telecommunication provider is just as important as choosing the right product. A true partner will analyze your business, understand your needs, recommend the ideal solution, and get you up and running quickly. A qualified provider will guide you through the process making sure you’re taking full advantage of all that VoIP has to offer. Adopting new technology can be both exciting and sometimes challenging at the same time. Whether you’re ready to make a full transition to VoIP or just want the capability for the future, this technology has the potential of reducing your costs, increasing profitability, and giving you a competitive advantage in your marketplace. By taking the appropriate steps and selecting the right telecommunications provider your company has a good chance of experiencing immediate returns. If not, you could be wasting valuable time and money.